This soup is called ABC soup because it is super easy to prepare, as simple as ABC! Soups generally taste nicer if you use a double boiler - a 2 tiered soup pot with the bottom pot filled with water. The soup in the upper pot is steamed by the boiling water in the bottom pot. 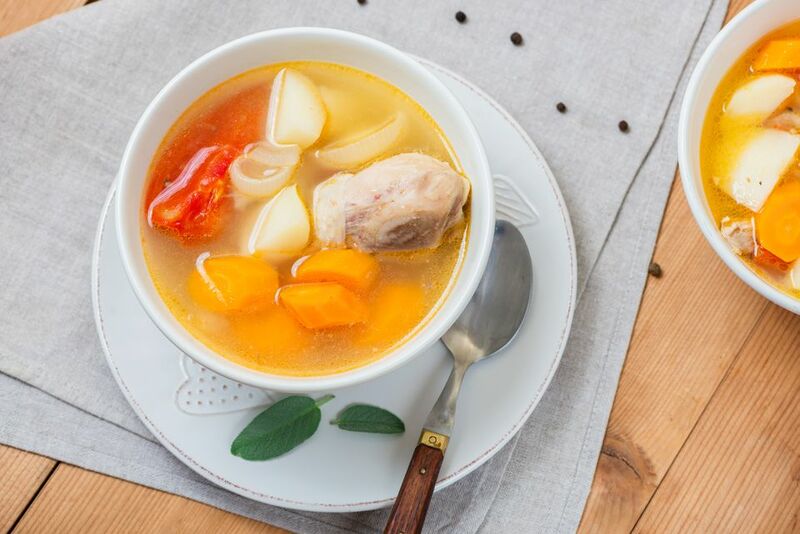 This gentler way of cooking soup releases the flavors from the ingredients gradually, and the result is a sweeter tasting soup. If you haven't got a double boiler, just simmer the soup on the lowest heat possible. Put the chicken pieces in a pot with just enough water to cover them. Bring to a boil. Pour away the water. Rinse the chicken under the tap to get rid of any blood or other impurities. Peel the potatoes and cut them into 1-inch cubes. If they are not immediately used, soak them in water so they do not turn black. Fill a double boiler or a soup pot with 4 cups of water. Put in the prepared chicken and boil over medium heat. Once the water boils, remove any impurities on the surface with a ladle. Turn the flame to low. Add the onions, tomato, carrots, and peppercorn. Simmer on very low heat for about 2 hours. Drain the water from the potatoes. Add them into the soup 30 minutes before the soup is ready. Add salt to taste, and enjoy!